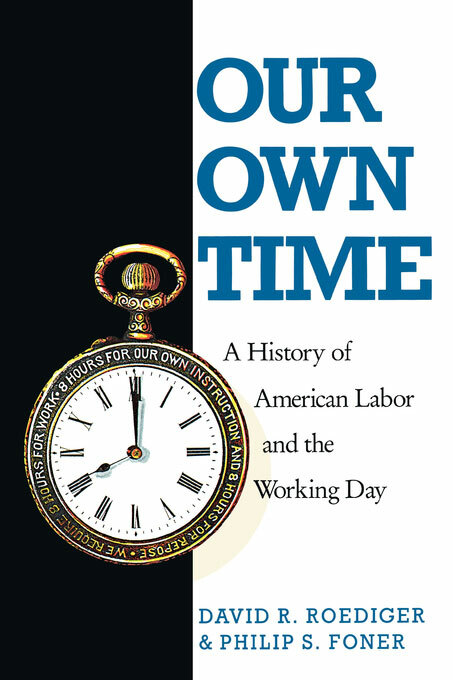 In celebration of May Day, we present an excerpt from Philip S. Foner and David R. Roediger's Our Own Time: A History American Labor and the Working Day. Read Part 2 here. Albert Parsons. August Spies. Adolph Fischer. George Engel. Michael Schwab. Samuel Felden. Oscar Neebe. Louis Lingg. The names of the victims of the governmental violence which took place after a bomb exploded in Chicago’s Haymarket Square during the unprecedented strike wave of May 1886 deserve pride of place in any account of the movement for a shorter working day during the 1880s. But the very nature of the Haymarket events, with all the excitement and heroism that surround them, has somewhat overshadowed other important considerations in understanding the period and Haymarket itself. This chapter describes Haymarket and its relationship to a continuing tradition of class struggle over hours, to the interaction between skilled and unskilled works, to ethnic interplay in the labor movement, and to the development of new organizational forms. One point is certain: Working hours remained long throughout the early 1880s. The most complete figures, covering 552 establishments in forty industries and twenty-eight states, date from 1883 and indicate that the mean working day was still over ten hours, including Saturdays. By that year a ten-hour, six-day week had become the norm in most of the surveyed industries, but glaring exceptions to this schedule persisted. When European socialists Edward Aveling and Eleanor Marx-Aveling toured the United States in 1886, they collected data showing that street railway drivers and bakers in various locales labored more than fifteen hours daily. Complaints concerning “shaving” of time by employers arose regularly, especially in textile mills, where, operatives complained, the manipulation of clocks often added twenty to thirty minutes to the agreed-upon working day. Despite laws passed in nineteen states, women and child laborers continued to bear the brunt of the taxing workloads. One Connecticut report showed that women in five and one child in three working in cotton factories stayed more than ten hours per shift, while just one man in eight did so. Numerous state labor commissions, from New York to Kansas, polled workers concerning hours throughout the decade and found a nearly unanimous sentiment in favor of a reduction. Three elements brought urgency and complexity to the struggle over the working day in the 1880s. The problems of high unemployment and intensified labor posed the issue of hours forcefully while mounting immigration raised new problems and opportunities for the shorter-hours movement. Although most arguments for less labor followed Steward’s theories concerning increased consumption as a result of a greater leisure, the simpler notion that a reduction of hours spread jobs became popular. The economy failed to enjoy four good years between the Long Depression of 1873 to 1879 and the renewed slump of the mid-1880s. Unemployment rates neared 13 percent in 1884 and 1885. A substantial population of “tramping poor” developed, an itinerant mass of tens of thousands of chronically unemployed workers. These “tramps” were a troubling phenomenon, which politicians, trade unionists, and businessmen could not ignore. While the Knights of Labor and the Federation of Organized Trades and Labor Unions explicitly linked their eight-hour calls with society’s desire to ease joblessness, anarcho-syndicalists headed leaflets “To Tramps” and promised that a just society would employ all, but for only two to four hours per day. Those working complained that jobs became harder. What one state labor commission described as the “hurry and push” system came to numerous industries as workers used words like “grinding” and “driving” to describe the pace prevailing in workshops and factories, especially after the introduction of steam power and new machinery. Ironically, some of the speedup in textile factories appears to have been inspired by a desire to increase production after the institution of rather effective ten-hour legislation. In certain large industries, subdivision of labor lent truth to the bleak observations of Episcopal clergyman R. Heber Newton, who told the 1883 Senate hearings on labor and capital that the American worker suffered alienation because he “makes nothing” and “is reduced to being the tender of a steel automaton.” Intense, alienated labor often brought an intense desire to lessen that labor. The third objection to ten hours is the presence of the Canadian French. Wherever they appear, their presence is urged as a reason why the hours of labor should not be reduced to ten…the Canadian French are the Chinese of the Eastern States…a horde of industrial invaders…not a stream of stable settlers…All they ask is to be set to work, and they care little who rules them or how they are ruled. As provocative recent works by Alexander Saxton, Gwen Mink, and Herbert Hill have shown, such early 1880s immigrant-bashings set precedents that would much favor the long-term development of conservatism and craft organization in the U.S. labor movement, aiding leaders most willing to ask much from the state in terms of immigration restriction and little in terms of labor reform, including shorter-hours legislation. It might also be added that the legislative prospects of such racist planks as Chinese exclusion had already, by the early 1880s, proven to be much better than those of effective labor reform. The reader thinks it probably a horrible thing to work 14 hours a day, and it is; but…in out-of-the-way towns, which are still deep in the mire of the middle ages, everything goes along in a slow way…It is simply impossible to work as many hours with machines as without them. Without machines the workman stops here a minute, there a minute; goes slower now and then, and is careful not to overwork himself. The Machine alters this. It does not stop for a minute, or run a little slower; it takes no consideration whatever…There the reduction of the hours of labor was a necessity. The movement for an eight-hour day influenced, and was profoundly influenced by, the ideas and practices of the two mass organizations of labor that grew during the 1880s. Both the Knights of Labor and the Federation of Organized Trades and Labor Unions (FOTLU, later the American Federation of Labor) made the shorter day a cardinal point in their programs. But the two organizations differed markedly in their approaches to the issue. Ultimately, one organization built the May 1, 1886, mass strike for the eight-hour day, while the other officially abstained from that struggle. However, in understanding the different attitudes of the Knights and the Federation, as well as the distinctive positions taken by more radical groups, it is well to recall that many activists held memberships in more than one body. For example, Albert Parsons was an “anarchist,” a Knight, and a typographical unionist, and even Gompers briefly held a Knights of Labor card. Moreover, members such as Peter McGuire who went from Lassalleanism to Marxism and to the Federation, and George McNeill who abandoned the Knights in favor of the Federation, often changed organizational allegiances. Finally, local bodies often acted with considerable autonomy so that national directives from either the Knights or FOTLU applied unevenly. Throughout most of the 1880s the largest and most important American labor union was the Order of the Knights of Labor. Local assemblies of the Knights existed since 1869 as labor-oriented secret societies replete with ritual and oaths. During the Long Depression these local bodies developed a centralized organization, but until 1878 the group lacked a platform. After dropping most of its secrecy and ritualism, the Knights of Labor grew rapidly, from 9,287 members in 1878 to 51,914 in 1883, to about 100,000 in 1885 and to possibly 700,000 in 1886. Apart from its size, the order exercised a key influence in the labor movement because it organized both skilled and unskilled workers, including black and female workers, and had a truly national constituency with a base in the South. On the other hand, the Knights did not limit their membership to wage-workers. The inclusion of local politicians and small businessmen strengthened the order’s predisposition against strikes. Under Powderly, as Marion Cahill has remarked, the Knights had “nothing that could be termed a policy” regarding hours. The organization drifted toward the use of legislative pressure to secure the shorter day, briefly supporting a lobbying effort designed to secure national eight-hour legislation. The impressive delegation that went to Washington, D.C., in 1880 to press for the law included Richard Trevellick, Albert Parsons, and Charles Lichtman, grand secretary of the Knights. But when it came to supporting the delegation with funds, the Knights faltered. Lichtman, who remained in the capital for six years, paid his own expenses. At the state level the Knights of Labor participated in several initiatives to pass shorter-hours statues. The early 1880s featured many instances of reformers wishing to curtail the length of the working day, and, especially where women and children were concerned, some ameliorative legislation did pass. The Bureau of Labor Statistics and pioneer female labor reformers, such as the Chicago socialist Elizabeth Morgan, played vital roles in marshaling support for those small improvements that did occur, but in some areas the efforts of the Knights also proved decisive. In Rhode Island the order organized successfully on the basis of its support for the ten-hour legislation before the state legislature from 1883 to 1885. In 1885 the state forbade women and children under sixteen from being employed more than ten hours daily, although the law was readily circumvented. The order also could claim partial credit for passage of Michigan’s 1885 ten-hour law and for the Ohio statue passed in 1886. While Michigan and Ohio hosted strikes, supported half-heartedly by the Knights, in order to enforce recently passed statues, the Maryland order struck first and then appealed to the legislature. The coal regions of western Maryland witness spectacular growth of the Knights in 1879 and 1880. When Knights District Assembly 25, representing 2,170 workers, published work rules in its Frostberg Mining Journal in 1881, the mining companies were taken aback. Not only did the rules specify a ten-hour maximum working day, but they set ten tons as a day’s production for a two-man crew. This meant that mine drivers, laborers, and mechanics — all of whom sometimes worked very long hours — achieved a standardized working day, and miners, who formerly worked by the ton on less favorable terms, could sometimes turn out a day’s production in a few hours and leave the mines. Mineowners complained of the high wages but appeared even more galled by the Knights’ presumption to manage work. After a year of living with the regulations, the owners provoked the Great Strike of 1882 by insisting on an elven-hour day and a wage cut. On March 14, 3,800 mine workers walked out. The strike spread, even into West Virginia, but soon lost momentum. The employers’ assault included importation of strikebreakers and eviction from company housing, but Powderly’s effect on the morale of the strikers was as harmful as any of the owners’ actions. The Knights’ leader privately opposed the strike and lectured local leaders with aphorisms such as: “Strike at the boss and hit yourself.” Powderly took no note of the hours issue and pushed for an arbitrated settlement based on the wages. Such a solution was not forthcoming, and the strike was four months old before Powderly acknowledged that it might be serious enough to require a special levy for support. Substantial support never arrived, and the miners admitted defeated after five months. In 1884 a ten-hour law applying to two mining counties passed the Maryland legislature with the support of the Knights, but the enfeebled mining unions could not force compliance. Formal struggle gave way to informal limiting of production by dissatisfied workers, but the Knights found no resurgence in Maryland. The craft unions and the FOTLU, like the Knights, displayed a consistent interest in eight hours. Unlike the Knights, they made attempts to develop a meaningful strategy to implement the demand. Many industrial unions, including the cigarmakers, carpenters, molders, furniture workers, and painters were on record as supporters of the eight-hour system. The National Federation of Miners and Mine Laborers, founded in 1885, placed the eight-hour day high on its list of objectives. With the advent of the Bessemer converter, some members of the Amalgamated Association of Iron and Steel Workers secured the eight-hour shift, either through strikes or by agreement, and the union favored universal adoption of the system. By 1884 the influence of Marxists and ex-socialists in the FOTLU had helped propel the organization toward trade union action to secure shorter hours. Leaders such as Gompers and Adolph Strasser of the Cigar Makers’ Union, J.P. McDonnell of the New Jersey Federation, and Peter J. McGuire of the Brotherhood of the Carpenters and Joiners had long been associated in the New York-New Jersey-Connecticut eight-hour struggles, socialist study groups, and various organizations allying trade unionists and socialists. McGuire, initially a Lassallean, stressed the importance of trade unionism to members of the Socialistic Labor party in the early 1880s. Although Gompers and Strasser had already begun a rightward swing, especially relating to internal matters in the Cigar Makers’ Union, both retained a commitment to eight hours heavily influenced by Marx and Steward. Gompers remembered that long hours stimulated his early thoughts of labor reform and considered the eight-hour day as the one demand that could produce working-class unity. At first McGuire, who espoused the eight-hour day as a “socialist” demand, failed to Gompers’s support for his proposal that workers should establish it by direct action. During the 1882 convention Gompers opposed McGuire’s resolution declaring the eight-hour system to be labor’s prime demand, although his opposition was mainly to the resolution’s class-conscious rhetoric, not a disagreement with its thrust. However, by 1884 Gompers helped to draft the fateful resolution that set May 1, 1886, as the date on which the eight-hour system would take effect in all industry. The resolution, which passed twenty-three to two, did not specify what tactics would be used, but when the delegates approved Frank K. Foster’s proposal that “a vote be taken in all labor organizations,…as to the feasibility of a universal strike for a working day of 8 (or) 9 hours, to take effect not later than May 1, 1886,” they implied that a massive work stoppage might occur. At first the Knights seemed likely to reach an accord with the FOTLU on tactics. The former organization, asked by the FOTLU “to co-operate in the general movement to establish the eight-hour reform,” had after all promised, at its 1884 convention, “to shorten the hours of labor by a general refusal to work more than eight hours.” But the actions of the Knights, and especially of Powderly, remained reflexively antistrike. Powderly’s approach to the eight-hour question was to oppose the FOTLU resolution and to call, instead, for Knights to write essays on the working day and to release the essays for the education of employers and the general public on Washington’s Birthday 1885. Any accounting for the differences between the Knights and the FOTLU regarding eight-hour strategy must take several factors into account. The Knights, who never completely shed their secret society trappings, generally failed to attract freethinking German socialists and thereby lost contact with the most theoretically advanced section of the labor movement. Irish influence, and with it a preference for boycotts rather than strikes, was great in the Knights’ officialdom although, at the local level, Knights often struck, and dramatic strike conflicts such as that of the Great Southwest Strike of 1886 led to the order’s most dramatic growth. Powderly’s own involvement in Irish nationalist politics may have increased his propensity to subordinate the hours issue to land questions. The greater size of Powderly’s organization also meant that it had more to risk than the fledgling, faltering FOTLU which had just 50,000 members when it undertook the May 1 plan. The Knights, because of their mixture of skilled and unskilled workers, also felt a variety of cross-pressures which the craft unions did not. Powderly held that the FOTLU could afford an eight-hour demand because the few workers it represented already had won working day days of ten or less hours, but that an organization representing the unskilled had to call the demand unrealistic for the many laborers who still sought the ten-hour day. Moreover, to retain an appeal to the unskilled, the Knights would have had to support the eight-hour day with no cut in pay, since the unskilled could not afford a large slash in wages. The FOTLU largely stayed silent as to whether wage reductions might accompany reductions of working hours, but the Knights could not sidestep the issue. During the months before May 1, 1886, yet a third current, an anarcho-syndicalist trend which not only regarded the legislative struggle as useless but saw all government power as an instrument of class oppression, attained prominence in the eight-hour movement. This rising “anarchist” influence afforded Powderly yet another reason to refuse to cooperate in the eight-hour struggle. However, the presence of anarchists did not originally motivate Powderly’s actions. It was fear — fed by Powderly’s own conservatism and by the ideological and organizational underpinnings of the Knights — of eight-hour strikes rather than of revolution that kept the Knights of Labor from supporting the FOTLU proposal. To understand the depth of that fear and the depth of FOTLU hopes, it is necessary to consider the largely overlooked record of labor conflict over hours which took place as the two major labor organizations deliberated during the early 1880s. One reason that the events of May 1886 have seemed to historians such a bolt from the blue is that strikes over the length of labor in the years preceding Haymarket have received inadequate attention. Henry David’s classic The Haymarket Affair, for example, discussed the supposed lack of legislative action on hours in the early 1880s and added, “Nor did labor, both organization and unorganized, spend its forces in strikes to secure reduction in hours.” David cited figures showing that only 1.26 percent of 1883 strikes concerned hours and that the figure rose to only 2.03 percent in 1884. Such figures understate the vitality of the shorter-hours movement during the years prior to Haymarket. During the period from 1881 through 1885, federal statistics list 142 strikes resulting from conflicts over hours. This number represents some 5.7 percent of all strikes. The 47,541 workers participating in the conflicts over hours account for 7.7 percent of all strikers during the same years. Because so many wage strikes were only brief defensive actions to restore pay cuts, such statistics still underplay the importance of the working day as an issue of the early 1880s. Hours sparked many of the largest, most dramatic strikes of the period and the conflicts most impinging on working-class life. Though mounted at a time when a national market was emerging for most commodities, the hours strikes of the early 1880s concentrated in industries whose products and services were still locally produced and consumed. For this reason the strikes raised the issue of the shorter working day not only to participants and members of allied crafts, but also to the broader working population, which felt the impact of the strikes. Drivers and laborers on street railways, for example, rebelled against a working day that often topped fourteen hours in a series of strikes that disrupted urban public transportation. Following a New York City railwayman strike in 1880 came walkouts in Boston (1881), Saint Louis (1881 and 1884), Cincinnati (1881), Chicago (1882 and 1885), New Orleans (1884), Brooklyn (1885 and 1886), and Petersburg, Virginia (1885). Thee Saint Louis strike of 1881 established a 72-hour week, but three years later, hours had been extended to 98 weekly. In New Orleans the “victory” of the 1884 strike established a fourteen-hour day, down from fifteen. Union and radical leaders stressed such incredibly long hours in arguing for public support for the transit workers and in generally raising the question of hours in public debates. Building tradesmen, also producers of locally used commodities, continued a tradition of long, large strikes over hours. Stonecutters in Philadelphia won the nine-hour day in 1881. Carpenters in Port Chester, New York, unsuccessfully attempted to reduce their ten-hour day the following year. By 1884 large strikes gripped the building trades. Over 2,000 Chicago carpenters walked out, most of them gaining an hour more leisure per week. In New Orleans 800 carpenters and laborers, working nine-hour days, successfully resisted a cutting back of their dinner hour. Twenty strikes involving 8,389 building tradesmen in four crafts punctuated the summer in New York City, and nearly a thousand Brooklyn plumbers suffered a lockout in a dispute over time. Fourteen of the New York City strikes did shorten the working day, usually from fifty-nine hours weekly to fifty-three. In 1885 stonecutters in Saint Paul and Baltimore also struck, both victoriously, and Denver bricksetters walked out in a successful defense of the forty-five-hour week. Alongside the interruptions in transportation and housing construction were strikes stopping the production of two working-class staples — bread and beer. Bakers, who often labored over a hundred hours a week, embarked on an impressive series of strikes in May 1881 in New York City. Involving over 600 shops and nearly 2,500 strikers, the strikes saw the winning of a 74-hour week for over half the participants. Some bakers in Chicago and Newark also gained huge reductions in the working day by striking in 1881, while Jersey City bakers struck unsuccessfully. Other walkouts involving bakers occurred in Chicago (1882) and New York City (1885). By the latter year, according to George McNeill’s accounts, working-class communities frequently employed “Saint Boycott” to wrest reductions in hours for bakers by patronizing only shops working on the shortest schedules. Workers in the brewing industry, organized in the Brewery Workers’ Union, also undertook an ambitious work stoppage in New York in 1881. Demanding a twelve-hour day, six days per week, and a brief two-hour Sunday shift at the unheard of rate of fifty cents per week, the brewers struck on June 6. The Central Labor Union of New York City boycotted scab beer. Nearly 2,000 brewers in Brooklyn, Staten Island, and New York joined the strike, but nowhere was it solid. Beer-truck drivers, ignored by the union, not only transported beer but did brewing work. Despite such weaknesses, the walkout resulted in a decrease of the working week from ninety-six to ninety hours for most brewers and gave a few a seventy-seven-hour week. By 1885 and 1886 a combination of effective boycotts and trade union pressure began to pay stunning dividends in New York City. The brewers there, who had worked fourteen-to-eighteen-hour shifts at the start of the decade, gained the ten-hour day, plus a wage increase and the abolition of Sunday labor in April 1886. Other strikes compelled attention because of their size and dynamism. For example, in 1883 — the year that David cites as the nadir of strike action over hours — just eight recorded job actions involved the issue but 12,603 workers participated. Two strikes alone, a national action by telegraphers and a New York City walkout by cloak and suit makers, involved over 11,000 workers. In a month-long strike the telegraphers demanded abolition of Sunday work and the institution of an eight-hour day. Their union expected massive aid from the Knights of Labor but received less than $4,000. The Knights’ leadership denounced the actions of the telegraphers as precipitous and influenced the decision of the union to admit defeat in mid-August. An important precedent was set that same year when 750 Jewish immigrants joined 5,000 other workers, almost evenly divided between the sexes, in the cloak and suit makers’ strike. This massive New York City action, described in the press as the “first immigrant strike,” sought an 8 A.M. to 6 P.M. working day at a $2.50 wage. Supported by the Knights, the Central Labor Union, and the newly organized Dress and Cloak Makers’ Union, the strike also benefited from the socialist leadership of Jacob Schoen, a Hungarian Jew, and Louis Smith, a Polish-Jewish veteran of the Paris Commune. The walkout won a wage boost, although it left the twelve-hour day intact. Organizing around the issue continued, especially in the Jewish Workingmen’s Union, which called for the eight-hour day in the first Yiddish labor leaflet in the United States, in 1885. A mass strike that year secured a wage boost and a cut in hours for cloak makers. The most dynamic strikes continued to occur in sawmill regions. It was there that the tramping strike, featuring roving pickets and parades, continued traditions established in the Schuylkill coal strike of 1868, the lumber strikes of the early 1870s, and the Saint Louis and Chicago actions during the 1877 railroad strike. There were four major “Sawdust Wars” in the early 1880s. Two thousand strikers participated in the Muskegon, Michigan, walkout of 1882, and over 1,200 joined the Marinette, Wisconsin outbreaks of 1885, but the strikes at Eau Claire, Wisconsin, in 1881 and in the Saginaw-Bay City-Menominee, Michigan, region in 1885 were but the most spectacular. At Eau Claire the July 1881 ten-hour strike spread to the many small mills in the area as tramping strikers visited plants. Although the only full account is a state labor report extremely hostile to the strikers, sections of the document admit that the strike enjoyed local support. So serious was the situation in Eau Claire that Wisconsin’s governor, William E. Smith, came to the city and wired for the National Guard. On July 22, 376 guardsmen, each displaying twenty rounds of ammunition, faced down 2,000 strike supporters described as “men armed with guns, clubs, pistols, crow-bars and mill tools.” Although the mills reopened on a twelve-hour basis, a chastened management quickly granted the eleven-hour day. In Michigan, 5,210 workers entered into ten-hour strikes in sawmills in 1885 and an additional 981 millhands were locked out in order to forestall a ten-hour strike at Menominee. Although a few local strikes, such as those at Zilwaukee and Muskegon, carried the demand, the failing strikes at Bay City, Saginaw City, and East Saginaw are of most interest as case studies in the labor solidarity, governmental action, and community response. They, like most of the Michigan strikes, stemmed from the passage of a state ten-hour law. Although the law allowed for the special contravening contracts and did not take effect until after the height of the lumbering season, the millhands could legitimize their struggle by referring to the statue. Although the Knights of Labor had done some agitation work in the area and had 3,000 members there, the strike started spontaneously when six or seven workers at Rouse’s Mill left the premises on July 6 shouting “Hurrah for Ten Hours.” Improvising a pennant from a bandanna on a stick, the small group visited another mill and initiated a series of processions that spread the strike in succeeding days. From the start, solidarity prevailed. The region’s mill labor force included American natives (38 percent), French Canadians (24 percent), Germans (20 percent), Poles (10 percent), Irish (4 percent), and other nationalities. At Bay City the various groups, especially unskilled Polish Catholics and more skilled German Lutherans, cooperated. An early strike meeting featured a black speaker. Most importantly, unemployed millhands, perhaps responding to appeals made by the Knights, took an active role in the processions. Bay City’s strikers enjoyed local support. Early processions were accompanied by a tolerant sheriff, himself a Knights of Labor member. The sheriff lost patience on the third day when 500 men attempted to close the Rust Brothers Mill by force. Three arrests occurred, but by evening the mayor, another Knight, ordered the release of those seized. The strike then spread until it involved 2,500 workers. The Bay City press generally backed the strike, though usually with less vehemence than journalist D.C. Blinn, a strike leader and editor of the local Labor Vindicator. Blinn’s calls for a general strike drew criticism, but the community remained prostrike. The city council reacted so strongly against the importation of Pinkertons by the largely absentee-owned companies that the detectives were withdrawn. Henry W. Sage, a leading businessman, denounced the city’s capitulation to the rule of mobs. After shutting down Bay City’s mills on July 10, about 1,500 protesters draped barges with banners reading “Ten Hours or No Sawdust” and journeyed to East Saginaw and Saginaw City. There they were met by another Knight, Thomas Barry, a Democratic-Greenback legislator who had introduced the state ten-hour law, and by longshoremen supporting the ten-hour day. The roving crowd closed all Saginaw-area mills, mostly without violence, but with a few incidents of clubbing and stoning. These incidents, and the feeling that Bay City “outsiders” had “invaded” the area, enabled the mayors of the two Saginaws, both sympathetic to the mill owners and one an owner himself, to deputize 100 Pinkertons. Even so, the strike in the Saginaws enjoyed some local support; the Saginaw City police chief and the militia captain of East Saginaw, both Knights, hesitated to use force to reopen the mills. While municipal authorities divided on their approach to the walkouts, the state government attacked the strike. Michigan’s governor, Russell A. Alger, an owner of several mills in the northern part of the state, came to Saginaw Valley on July 14. Alger was an opponent of the ten-hour system who insisted that his employees sign contracts promising to continue longer hours. Despite the nearly total absence of conflict during his stay in the valley, Alger called out state troops in a move which, as Jeremy Kilar observes, “was part of a determined effort to reopen mills and intimidate strikers.” As such it was partly successful. The five companies of militia enforced the governor’s ban on parades and mass meetings. Alger called for the arrests of Barry and Blinn under the state’s anti-labor Baker Conspiracy Laws. While these actions broke the enthusiasm of the strikers, they did not win full community approval. With the Knights offering to protect the mills, the rationale for keeping troops in the region was suspect, and after a week the militia withdrew. But the period in which the militia occupied the region gave the initiative back to the owners. Members of the millowners’ association issued statements that they would open the mills only on their own terms and held, perhaps disingenuously, that the strike benefited them by limited lumber supply. By July 25 owners reopened a few Saginaw mills on the ten-hour system with a wage cut. When a logjam caused flooding of farmland near Saginaw City, local support for the strike eroded with the soil. Powderly, who visited the area, delivered another blow by counseling acceptance of ten hours’ wages for ten hours’ work. The back-to-work movement in the Saginaws grew and, when Bay City mills sent their logs to the Saginaws for processing, Bay City millhands became anxious and some mills opened. After August 6 strikers engaged in a series of battles with police and local militia at reopened mills. At Saginaw strikers suffered clubbings and in Bay City a brief gun battle left a sheriff and three strikers wounded. By late August these last violent gasps of the strike ceased and defeated millhands returned to work in hopes of making some money before the slack season. Most mills converted to ten hours on September 15, the day prescribed by law, while cutting wags. But in the Saginaw Valley strikers did not offer entirely bleak lessons for the labor movement. They again showed the capacity of the hours demand to unite a variety of laborers in a common cause. Mill owners, who pledged to refrain from employing immigrants in the future, had learned what the nation was to learn the following May — that foreign-born and unskilled workers could act on the demand for a shorter working day. Read part 2 of "Haymarket and Its Context."